Dr. Rob Green is a chiropractor who is passionate about helping people. His purpose is to improve people’s lives through health and wellness. Dr. Rob truly believes that health and fitness is the foundation for creating a happy and successful life. When you are moving and feeling your best, you can be your best! Dr. Rob provides a number of services that are unique and tailored towards each individuals’ needs. His services include soft-tissue therapies (Active Release Technique), joint manipulation, contemporary medical (electro-) acupuncture, kinesiotape, movement retraining and bio-mechanical assessments. This provides all patients with a variety of therapies to use to maximize treatment effectiveness. In combining multiple-treatment approaches, he creates a potent treatment plan to enhance and optimize results. Educating his patients and clients is the foundation for success. Dr. Rob believes the more a person knows, the more they can control their own health and fitness. This unique approach also allows Dr. Rob to help solve more than just neck and back pain, but also help with drug free pain relief of knee and ankle pain, vertigo, headaches, TMJ issues, shoulder and elbow pain as well as sports injuries and a variety of other problems. As a chiropractor with a decade of experience, Dr. 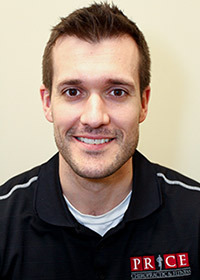 Rob prides himself on his caring approach, listening to his patients and doing his best to solve their concerns so that he can help them achieve their personal health goals. You can see Dr. Rob’s reviews here on RateMds.com and the Price Chiropractic & Fitness reviews on GOOGLE Here. Dr. Rob focuses not only on getting his patients out of pain, but fixing the underlying cause of the problem so the pain goes away and stays away allowing them to lead a higher quality of life. “I have been to other chiropractors and health professionals and never have I received such wonderfully personal care. After being rear ended you did a fabulous job providing me relief. When I tore my ACL, Everyone took great care of me. I always feel welcomed and wanted at this center, leaving feeling refreshed and recovered.”- M. P.